Miss Grand International 2017: Xin Chào, Vietnam! Global Beauties' has just arrived in Ho Chi Minh City, Vietnam for the 5th Miss Grand International competition, which officially started today. 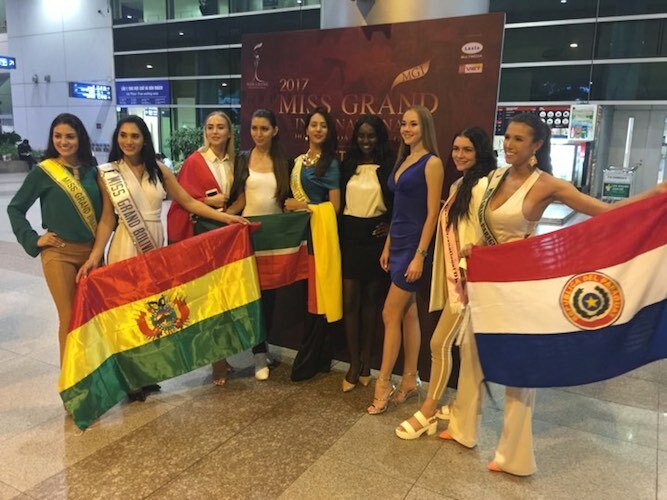 Arriving at the same time were a bevy of beauties who are all very excited to take part in the first ever Miss Grand International pageant in Vietnam. The atmosphere at the airport was electric and the girls were cheered on by some eager fans who excitedly took photos of them as they made their way to their meeting point. Everyone was thrilled by the warm and hospitable welcomed from the Vietnamese people. The girls were delighted to meet some very excited fans! 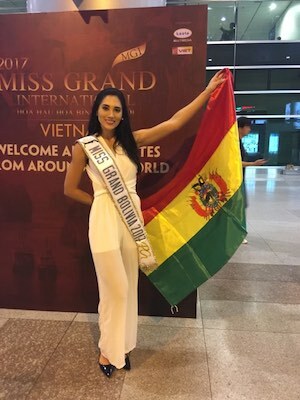 Miss Brazil, Caroline Venturini, traveled for almost 2 full days to get to the pageant. She was all smiles as she mingled with fans and was greeted by none other than the organizer of Miss Grand International, Mr. Nawat Itsaragrisil, who just happened to arrive at the same time as our team. Other South American beauties who just touched down were the delegates from Bolivia (Mariem Suárez), Colombia (Francy Castaño) and Paraguay (Leah Ashmore). The President of MGI arrived at the same time as our team! Miss South Sudan, Eyga Mojus, is a real head turner and very elegant. Miss Denmark, Iben Haahr Berner, is one of the other beauties who just arrived in Vietnam after a long flight. Aigul Zaripova from Tatarstan is the first woman from her autonomous region in Russia to compete at Miss Grand International after not making it to the contest in 2014. This year her dream has come true as she has is now in Vietnam and ready to do Tatarstan proud. Tatarstan is ready to do her country proud! Russia's Svetlana Khokhlova and Marina Panova from Belarus have also arrived at the pageant. The resemblance between them is uncanny and they could easily pass off for twins. Can you spot Russia's "twin" in the group picture above? After a long trip, our team will now head to the Pullman Saigon Center Hotel for a well-deserved rest. Stay tuned for our exclusive coverage from Ho Chi Minh City tomorrow!